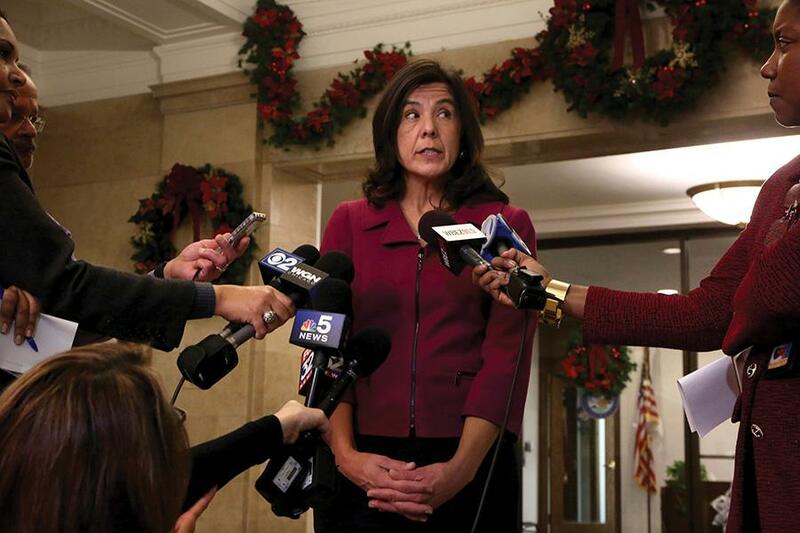 Cook County State's Attorney Anita Alvarez takes questions about recent allegations after protesters stormed the George Dunne Cook County building at 69 W. Washington on Dec. 3, 2015 in Chicago. Three Northwestern law professors have filed a motion petitioning for the appointment of a special prosecutor in all matters related to the fatal shooting of Laquan McDonald. McDonald was shot 16 times by officer Jason Van Dyke of the Chicago Police Department on Oct. 20, 2014. A little over a year later, dash-cam video of the incident was released and Van Dyke was indicted on six first-degree murder counts. The petition, submitted Feb. 16 with co-counsel from the University of Chicago Law School and the People’s Law Office, states that there is a conflict of interest in the case due to the relationship between Cook County State’s Attorney Anita Alvarez and CPD. “Anita Alvarez is disqualified from representing the People in connection with the prosecution of Chicago Police Officer Jason Van Dyke as well as … the Chicago Police officers who participated in the falsification of reports, the destruction of evidence, the manipulation and coercion of witnesses and other possible misconduct in the aftermath of the fatal shooting of Laquan McDonald,” according to the petition. The document goes on to explain the “unjustified” police shooting, the police’s misconduct, Alvarez’s delay in charging the officers and the public’s subsequent lack of confidence. School of Law Prof. Sheila Bedi said it felt “critical” to directly present the issue before the court after receiving support from McDonald’s family and elected officials. NU professors became involved with the case due to the long-standing history their office has in ensuring transparency and integrity in the Cook County criminal justice system, Bedi said. “This is certainly an example that screams out for the appointment of a special prosecutor,” she said. The listed petitioners include one of McDonald’s family members, community organizations and politicians such as Jesús “Chuy” Garcìa, a member of the Cook County Board of Commissioners who ran for mayor last year. School of Law Prof. Locke Bowman, director of the MacArthur Justice Center, said he and the other lawyers who filed the petition are serving as the petitioners’ counsel. In a statement to The Daily, the State’s Attorney’s office noted Alvarez “has brought charges against 96 law enforcement officers when those charges were appropriate, and this case is no different.” It also said Van Dyke has already been indicted, and two different assistant state’s attorneys have been assigned to the case. Bedi said this does not make a difference because the other officers at the scene have not yet been charged, and Alvarez is ultimately the one supervising the assistant state’s attorneys. Both Bedi and Bowman cited the case’s delay, the timing of the filing of charges to coincide with the release of the video of the shooting and the fact that none of the officers besides Van Dyke have been charged as reasons for concern. University spokesman Al Cubbage deferred comment to the involved faculty. The case returns to court March 17. Due to an editing error, a previous version of this story included an incorrect caption for the photo of Cook County State’s Attorney Anita Alvarez. The caption has been updated to reflect that Alvarez is depicted in the photo taking questions following the storming of the George Dunne Cook County building on Dec. 3, 2015 in Chicago.